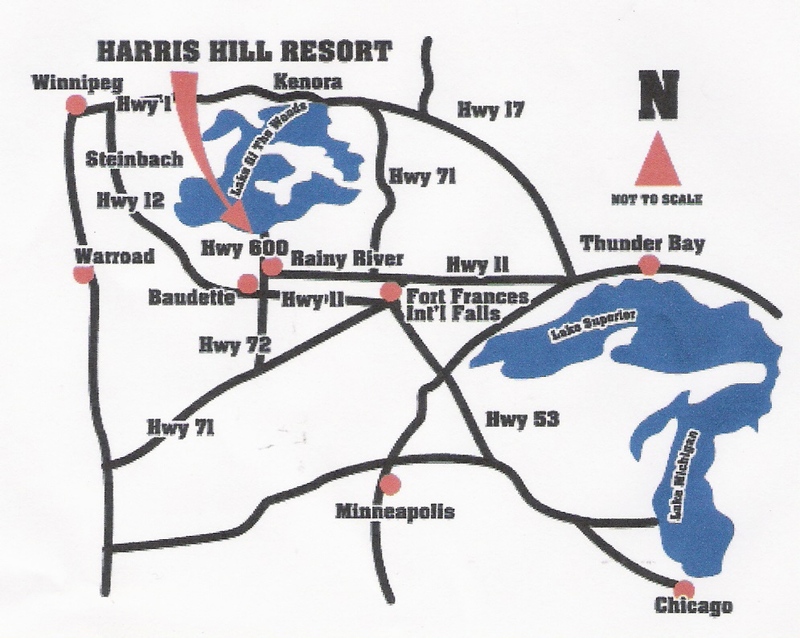 Harris Hill Resort is located on the southern end of famous Lake of the Woods, between the towns of Rainy River and Morson, Ontario. 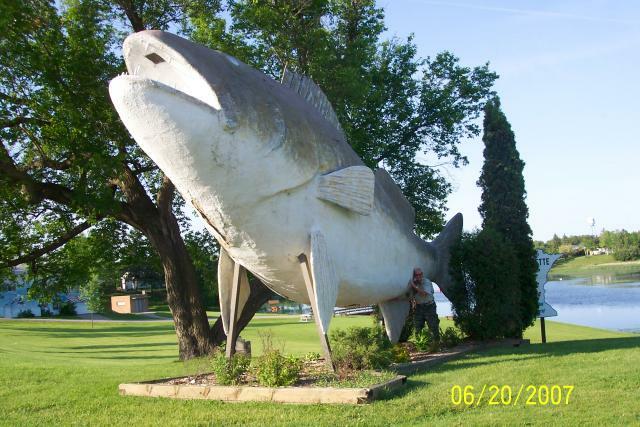 You will find us only one mile off of Highway #600 on Fishery Road, just 18 miles North of the Baudette, Minnesota and Rainy River, Ontario border. This border crossing is toll free, and has virtually no line-ups. See maps below, and written driving directions. In a Protected Bay where the Islands start and your Fishing adventure begins on Lake of the Woods for 7 Species of Fish. Although Lake of the Woods is a big lake, we fish a very small radius as most Fish are caught within 5 miles. Mnay fish further away for a change of scenery and up to 10-12 miles for Musky. Great Fishing right in the Bay in front of the Resort for 6 of 7 species too! GOOGLE MAPS (# OF HOURS TO GET HERE) IS WRONG! Consider flying in to International Falls, MN (1.5 hours from here), Thunder Bay, ON (5 hour drive) or Winnipeg, MB (3 or 4.5 hour drive depending on route). You can rent a car and take a drive to get here. If you have your own plane, you may fly into Baudette, MN and we can pick you up. Proceed past the Canada border, then stop at the USA border crossing. Continue straight, and you will come into Warroad, MN. At Warroad, Minnesota turn left on Hwy #11 East (at Stop Light). Large Yellow buildings on left, Marvin Windows. Proceed East, following #11 Hwy TO BAUDETTE, Minnesota. approx 40 minutes. The office/lodge is the log sided building on the left. It has a Harris Hill Resort sign on it too! Proceed out of town towards Rainy River, Ontario going west on Hwy #11. You will have two choices: you can turn at Sleeman onto Hwy 621 or proceed to Rainy River. (CHOICE #1) Hwy 621 - Turn right on Hwy 621 and follow until you reach Hwy 600 at Bergland corner. Take Hwy 600 Left, going west 6 miles until you see our Harris Hill Resort sign in front of you. Turn Right, going North on Fishery Road for 1 mile then straight onto Harris Hill Drive; we are a log-sided building on the left hand side. The office/lodge is the log sided building on the left. It has the Harris Hill Resort sign on it too! While travelling you will leave Manitoba and enter Ontario without having to pass through a Border Crossing. #1 Hwy now becomes Highway 17 towards Kenora Ontario. Kenora is located at the north end of Lake of the Woods. Visit the Harbourfront and Husky the Muskie. Go for a Lake tour on the MS Kenora. Just past Kenora, turn right on Hwy #71 South, going towards Sioux Narrows, Ontario. You will pass by Rushing River. Watch for the water falls on your left hand side of the road. Nestor Falls - watch for the Waterfalls on the right hand side of the road. Proceed south until you reach Highway 11. Stop for a snack at JD Junction! Across the Road from JD Junction there is an attraction site to see, an Aboriginal Monument. If you were turning off of Hwy 71, turn right, or go WEST towards Rainy River. You will pass through Barwick, that boast a beautiful waterfront park. You will pass through Stratton, then past the Kay-Nah-Chi-Wah-Nung Historical Centre that portrays the history of the Anishinaabe (Aboriginal) peoples. You you have two choices: you can turn at Sleeman onto Hwy 621 or proceed to Rainy River. Turn Right, going North on Fishery Road for 1 mile onto Harris Hill Drive; we are a log-sided building on the left hand side.